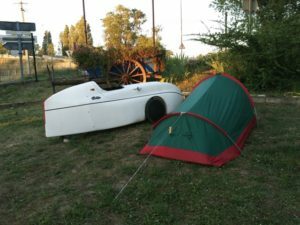 The initial motivation that got me into the velomobile business was the intention to develop a human powered vehicle for comfortable traveling over longer distances, in harmony with own body and environment, allowing to fully admire and enjoy the wonderful nature, places and people on the track. Travelling as such would become an enriching experience and adventure on itself, in contrast with today`s alternative of speeding on a highway, burning fossil resources to move as fast as possible from point A to point B. 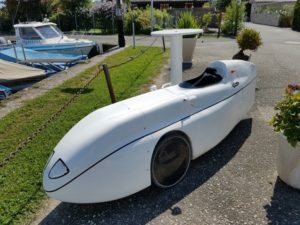 After a long internet research, I finally discovered the velomobile concept and it took me again a couple of months and a bore-out in my previous job to create Katanga and start from scratch in this new activity. After 5 years of hard work and continuous improvements on the WAW, it was time to confront dreams with reality. My family is scattered on different places on the globe and we try to meet 2 times a year. The meeting place in summer is always the South of France were my parents live. 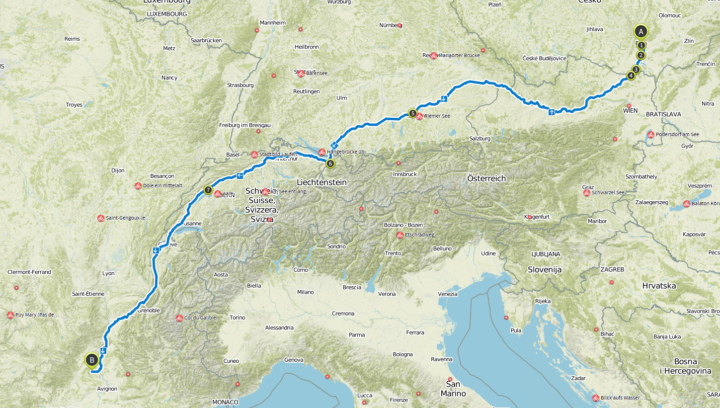 This is a trip of 1600 km by road with the Alps in the middle. An ambitious plan to do this with the WAW. Which WAW to take for this trip? 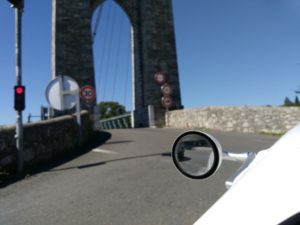 For a shorter trip of 2-3 days, not crossing the Alps, the choice would have been for sure my sportive, hard tail carbon WAW with classic 3×10 transmission. But in this case my daughters glass fiber WAW with Bafang mid drive engine, Rohloff and rear suspension seemed a better choice. My condition is not bad but I miss training. I will be 50 this year, weigh only 55kg and due to knee problems my doctor instructed me not to bike intensively any more. We added a chain protection, puncture free Marathon plus front and rear tires and mounted a smart phone holder next to the Bafang display. No change necessary on the brakes because the 90mm SA drum brakes offer plenty of brake power, no luxury if you cross the Alps. Instead of a separate 12V battery for the integrated light system, a convertor was mounted between the 36V engine battery and the light system. This removed the task of charging yet another battery. For back-up reason an independent front and rear bicycle light was added to the equipment but they weren`t needed. All luggage found a place behind, under and next to the seat. For increased autonomy, I took a second engine battery with an additional loader. Enough clothes, an extra pair of shoes, stuff for personal hygiene, sun cream, insect repellent. Tent, matrass, sleeping bag. A big 1,5l water bottle as reserve and a smaller drinking bottle, isotonic tablets. Smart phone, reading book, reading glasses, ID card, bank card, some cash money. A minimal tool kit with a spare 20 and 26 inch tube. Ready. Completely packed the WAW weighted approximately the same as myself. Ouf! I took off on Friday morning 22nd of July and left all stress of work behind me. I arrived Saturday 30th before noon at destination, extremely happy and healthy, with 1700 km on the meter and an average speed of 28 km/hour. Relating in detail the whole trip would be long so I prefer to share some experiences and conclusions. 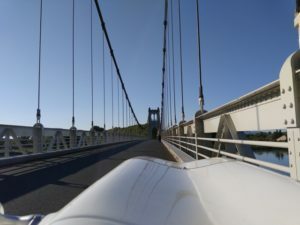 In last 20 years the infrastructure for cyclist has made a big jump forward and let`s hope that this movement continues because there is still a lot to improve. 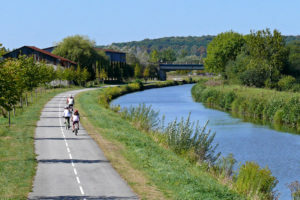 Initiatives like EUROVELO are very advanced in several countries. 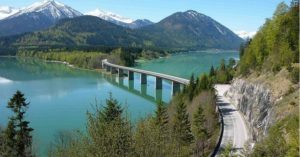 Germany and Switzerland surprised me with good basic cycling infrastructure. 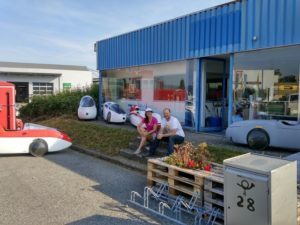 These bicycle roads are of course not conceived for travelling with a velomobile and today velomobile users need to choose between slow but safer bicycle roads and faster but more dangerous common roads shared with cars. Ideally, maximal speed for common cars will be lowered on secondary roads in the coming years, allowing a new type of vehicles, lighter, slower and more energy efficient, to share more safely the same road. The downloaded track contained on purpose a lot of cycle roads. 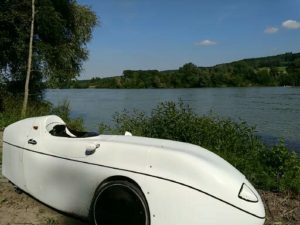 Some parts were ideal for a velomobile but most of it was not. Too often these bicycle roads are a patchwork of interconnected small roads made for slower bicycle tourism. Too many start/stops, you notice the change of direction too late or not at all and need to turn back and find the track again, exceptional parts were more suitable for a mountain bike… Average speed on faster roads was around 35 km/h but on the slower sections it plummeted to 18 km/h. My inexperience in traveling and in using the smart phone are to blame for losing much time in these too slow tracks. Catching up with this and use more intelligent applications like BRouter, will increase considerably the average speed and reduce total travel time. 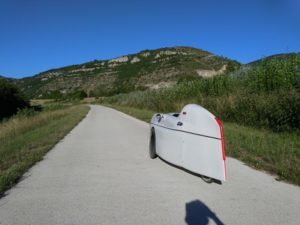 Crossing the Alps with a velomobile is not that difficult if you avoid climbs and descends even at the cost of increasing considerably total distance. Follow the rivers, was Patrick’s advice. One time I omitted his advice and followed the downloaded track in Komoot but after the first climb I wisely turned back. After having stayed North of the Alps till Lake Constance, I followed the Rhine to the West till the river Aare. The Aare led me to the Neuchatel lake. From there I drove to Lausanne at the Geneva Lake. Following the Rhone brought me in France. There I left the Rhone, crossed a mountain to join the Isere valley and found the Rhone back in Valence. Staying with family/friends or sleeping in the tent in a camping was the most fun (and cheap…). Even when travelling alone I could this way meet people. I missed Roland but met T. Irma, Daniel, Patrick, Jordy and many others of which I forgot the name. 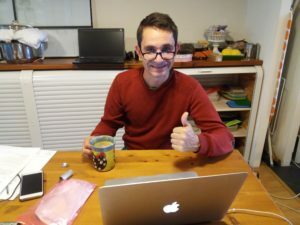 Due to my poor experience with the smart phone I could not always find a camping place when the evening fell and had to fall back on a pension or hotel room. I also did not use www.warmshowers.org for the same reason. Again an improvement for next trip. I found it healthy, comfortable and not too expensive to take a longer break at noon of 2-3 hours in a restaurant, consuming and digesting the menu of the day. Nutrition for breakfast and supper was very simple and bought once a day in a supermarket on the road. Water was filled from the tap at every occasion. We have been trying hard in all these years to provide our customers with a beautiful, efficient and fun-to-ride bike with the right compromise between robustness and weight but apart from systematic test rides before delivery and occasional day trips with my WAW, we never made ourselves an endurance test like this. What a pleasant feeling and satisfaction to do all this trip without any real problem on the WAW! For the research purpose I did not spare it but treated it a little brutally, used regularly off-road tracks with sand and gravel and took several bumps at high speed. The tube holding the Smartphone and Bafang display did not stay well in place, a rubber band solved it provisionally. Back in the work shop I also laminated an extra layer in the lower corners of nose and tail. Some smaller cracks appeared there after hitting pavement sides or hitting bumps on the mountain bike single tracks. The rear idler made a little more noise when arriving at destination, but we could not find any reason for it. We use idlers with steel teeth for better durability knowing that they make more noise than idlers with plastic teeth… That are about all the problems encountered. The combination Rohloff and engine helped a lot on the slow bicycle tracks. Brutal braking needed shifting back which Rohloff (or other hub gearing) allows when standing still. The engine helped considerably in getting effortless back on speed after frequent stops or 90 degree turns. The first days I used the engine a lot to spare my problematic knees and get slowly used to the rhythm. After a couple of days, as nothing did seriously hurt, I started to rely less on the engine but I took care never to be exhausted so that I could hold the rhythm for a whole week. A full charged battery served for about 110 km on not too hilly terrain but only 70 km if I was climbing a lot. I tried to make days of 250 km and I charged the batteries during the pause at noon. Complete charging took more than 6 hours and apparently this is low due to the type of connector on the battery. In the future this can be upgraded to charge 2x faster. The rear suspension did exactly what it was created for. It made driving on bad quality surface real fun and comfortable. After one week sitting in the WAW, I still felt very comfortable and could almost sleep in it . The sitting position allowed to observe well the nature around including birds in the sky. I think that for this trip I had the right WAW, but to be sure different versions must be compared. There is not something like an ideal configuration for the WAW that fits every person and every situation. Many solutions are possible depending on a wide range of preferences and answering a wide range of needs. The WAW is flexible and can offer this variability. One must be careful with driving a velomobile on common roads. You are more vulnerable then with a car and must behave more preventively. 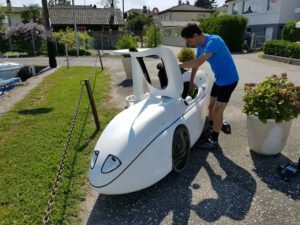 The lower size of the velomobile makes you less visible especially in dense traffic. Activating the day lights in flashing mode increased strongly visibility of the WAW during the day. Speed means always danger and you need to know the limits of your vehicle, for this you need experience. Wearing a helmet would be a smart prevention to consider. After this trip I conclude that the WAW can really be used also for long distances. You need to free more time than with the car but it largely pays off in joy and pleasure. The WAW is a mature bike on which you can rely on most kind of roads. It offers a variety of options to satisfy a broad public. Personally, I am looking forward to a next trip soon. Advanced use of the smartphone and better route planning will reduce effort per km and increase average speed. What a great article, very inspirational and balanced. Having recently acquired a WAW and made the "Virgin Journey" of 200km in a day with a few ferries along the way I look forward to more ambitious trips in the future. What a fantastic trip Stephane,reminded me of my last few tours with the WAW and Quest. Thanks for the report - much to think about. Did you take the hood with you, or just hope it did not rain?!? I sometimes wonder if a fabric tonneau cover might be useful if one prefers to leave the hood at home, but would still like to deter rain and prying fingers from the inside when parked.